MBC has announced that Heartstrings <넌 내게 반했어> will end at episode 15. Several days ago, the director of the drama discussed with Star News saying that "Heartstrings will be a 15 episode drama." Heartstrings's actress Park Shin Hye was hospitalized earlier due to a car accident which cause a setback on the continual filming of the drama. Park Shin Hye demonstrated her fighting spirit by going back to work soon after to continue filming but due to severe pain, she was eventually forced to take a week's rest. MBC had then broadcast a special in place of episode 8 which was scheduled to be broadcast the same week as episode 7. The special was a collection of scenes from episode 1 to episode 7. Because of this, the drama is behind one episode, thus reducing the original 16 episodes to a 15 episode drama which will broadcast its final episode on August 18th. 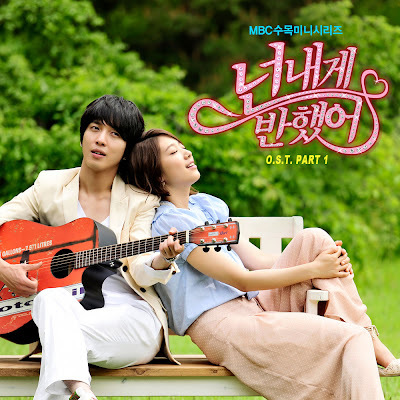 Nevertheless, Heartstrings has been bought by eight different countries including the United States, Japan, and China and will be broadcast there. In regard to episodes overseas, the drama may be edited to be 12 episodes or 20 episodes or any number of episodes befitting that country. Heartstrings is a college drama about hopes and dreams of youth, of first love. Park Shin Hye and CNBlue's Jung Yong Hwa are in the limelight as two of Hallyu's brightest stars. The rights of the drama was bought by the US, China, Hong Kong, Philippines, Japan even before the broadcast of the series. Even though the drama has been shorten, let's continue to show the cast and crew of Heartstrings how much we love them. Heartstrings, FIGHTING!! We love you! sad but lets make the most out of what's remaining of the episodes..i will surely miss the sweetest couple ever, the dooley couple...otoke?.since it is an online hit overseas, i hope that there will be offers and fans' clamor for overseas FMs..
Oh no! It will be so sad to see this drama end! I want the sweet couple to keep on being a couple. I hope the writers will not make the story rushed. I love this show! Nooooooo!! !This is sooooo unfair!Many others drama has to take rest for week for some reason.Why Heartstrings has to be cut down?? ?Soooo not cool this MBC. This can't be...!!!! why its shorten..??? no...!!!!! please don't do that..!!! I am a fan. A fan of this couple who seems so right for each other in your YB and now here in Heartstrings. I love the storyline and Yonghwa has improved a lot in his acting. I love his facial expressions for he has very impressive eyes and a Smile that just melts my heart. Heartstring is a heartwarming story and for me will be unforgettable. Thank you Heartstrings, yonghwa, Shinhye, all the cast and crew, producers, directors and everyone else who made this drama possible so we can be entertained. KUDOS to all and to the fans of Yonghwa, SHin Hye and HEartstrings...God Bless. A warm greetings from Sunny California. It is okay even if it is 15 episodes.. I know that is a business decision since they miss to air 8 due to SHin Hye's accident. I am glad that she is okay. My friends and I continued to support Heartstrings even if the ratings are just so so. Anyway, I don't about ratings..SOme people look for conflict but I like the way the writers presented this story...It is relatable for I think young love should be just like that. It showed us how a young love can be that strong when tested by some school scandal. Shin is the epitome of the BESTBF ever in the history of dramaland.. His young mind and heart is so understanding and loving and I want to have someone like that in near future.HEARTSTRINGS, THE BEST OF LUCK. Will there be a 2nd season where they will all be grown up and both are successful. Hello,,,, I really like hearstings. I am a fan of Shin Hye and yonghwa..... I'm from Indonesia. OMG! please make a season 2 pleaseeeeeee!!!!!!!!!! Will there be a season two? I really want them to have a season two.. I can't get enough of it. It's really beautiful. I don't want it to end just yet.